AC Milan defender Leonardo Bonucci was sent off for the first time in five years in the goalless draw with Genoa. 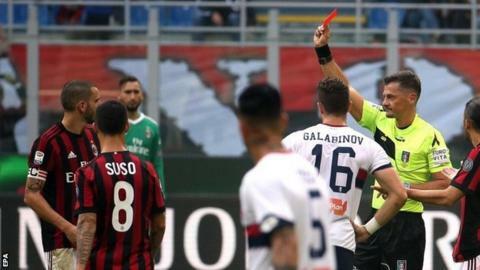 The 25th-minute red card for elbowing Aleandro Rosi means the Italy centre-back is likely to be banned for Saturday's game with Juventus, the side he left after seven seasons in July. Milan, who spent at least £175m in the summer, drop into the bottom half. Elsewhere in Serie A, Aleksandar Kolarov scored an excellent free-kick as Roma beat Torino 1-0. The side from the capital have equalled the longest away winning run in Serie A history as they chalked up their 11th in a row. Eusebio di Francesco's side move up to fifth in the table, seven points behind leaders Napoli. Sami Khedira scored a hat-trick as 10-man Juventus came from behind to beat Udinese 6-2. Ciro Immobile scored twice as fourth-placed Lazio beat Cagliari 3-0. Fiorentina won 3-0 at Serie A newcomers Benevento, who have become the first side in the league's history to lose their opening nine games of a season. Chievo beat Verona 3-2 in the city's derby, Atalanta defeated Bologna 1-0, and Sassuolo won by the same score at SPAL. Match ends, Milan 0, Genoa 0. Second Half ends, Milan 0, Genoa 0. Foul by Cristian Zapata (Milan). Adel Taarabt (Genoa) wins a free kick in the attacking half. Luca Rossettini (Genoa) wins a free kick in the defensive half. Corner, Milan. Conceded by Armando Izzo. Attempt blocked. Patrick Cutrone (Milan) left footed shot from the centre of the box is blocked. Andrea Bertolacci (Genoa) wins a free kick in the defensive half. Attempt missed. Miguel Veloso (Genoa) left footed shot from outside the box is high and wide to the left. Assisted by Federico Ricci. Substitution, Milan. Patrick Cutrone replaces Nikola Kalinic. Attempt missed. Adel Taarabt (Genoa) header from the centre of the box is just a bit too high. Assisted by Federico Ricci with a cross. Attempt saved. Suso (Milan) left footed shot from outside the box is saved in the centre of the goal. Assisted by Lucas Biglia. Attempt missed. Fabio Borini (Milan) right footed shot from the right side of the box misses to the right. Attempt blocked. Fabio Borini (Milan) right footed shot from the centre of the box is blocked. Assisted by Suso. Ricardo Rodríguez (Milan) wins a free kick on the left wing. Foul by Federico Ricci (Genoa). Substitution, Genoa. Federico Ricci replaces Luca Rigoni. Fabio Borini (Milan) wins a free kick in the attacking half. Attempt missed. Suso (Milan) left footed shot from outside the box is high and wide to the left. Assisted by Davide Calabria. Gianluca Lapadula (Genoa) wins a free kick on the left wing. Attempt missed. Franck Kessié (Milan) header from the right side of the box misses to the right. Assisted by Suso with a cross following a corner. Corner, Milan. Conceded by Miguel Veloso. Offside, Genoa. Adel Taarabt tries a through ball, but Gianluca Lapadula is caught offside. Attempt saved. Fabio Borini (Milan) right footed shot from outside the box is saved in the centre of the goal. Assisted by Nikola Kalinic. Substitution, Milan. Davide Calabria replaces Giacomo Bonaventura. Attempt missed. Franck Kessié (Milan) right footed shot from the right side of the box is close, but misses to the right. Assisted by Suso following a fast break. Corner, Genoa. Conceded by Alessio Romagnoli. Foul by Nikola Kalinic (Milan). Andrea Bertolacci (Genoa) wins a free kick in the attacking half. Cristian Zapata (Milan) wins a free kick in the defensive half.